I am just back from a trip to Dubai, hence my lack of activity, where I ate a number of superb Indian meals. Given the UAE's proximity to India, it is no surprise that the standard of Indian cuisine in the region is top quality. I have mentioned before Indian is my favourite cuisine but Biryani is usually the section of the menu that I tend to pay little or no attention to, after all it's hard not to go to a curry house and not order a curry. I stayed in a hotel that had an in house Indian restaurant and in the space of 7 days, we visited 3 times it was that good. Before visiting the restaurant in question I had previously thought of Biryani as a dish that was mild and lacked any real depth of character. How wrong I was. The process of cooking and constructing this dish is every bit as intricate as making a curry with the flavours built up and constructed separately rather than in a gravy. It takes a bit of time however with 30 mins of prep, 30 mins constructing the dish and 30 mins cooking time. The first stage of preparing the Biryani is to marinade the chicken so the yoghurt and spices have time to penetrate the meat. As usual, if you can do this overnight you will see better results but in the real world up to an hour is suffice. Simply cut the chicken into medium sized chunks and place in a dish along with the marinade ingredients. Place in the fridge and let it do its thing. The next stage is to fry the onions which will act as one of the layers when constructing the dish. They will give a sweetness to the dish that is more subtle than regular sugar found in other Indian dishes. Simply add two and a half onions to a frying pan on high heat with 3 tablespoons of oil and fry until crisp. When you initially remove the onions they will appear to feel soggy but placing them on some kitchen roll will ensure the excess oil is absorbed leaving a perfectly crisp and welcome addition to the dish. On to the chicken; ensure you remove from the fridge half an hour before cooking. Using the same pan that was used to fry the onions, bring up to high heat until it starts to smoke. Add 25g of butter and fry the chicken in two batches. Each batch should take around 6 minutes to cook. Ensure you scrape the bottom of the pan to remove the burnt yoghurt and discard otherwise the dish will have nasty pieces of burnt yoghurt throughout. The intention is to fry the chicken so it has a caramelised exterior but still undercooked as it will continue to cook at the next stage in the masala sauce as well as in the oven when everything has combined. Once you reach a dark golden brown sear remove and set aside. On to the masala sauce, add 25g of butter along with the remaining half an onion and fry until soft and the water from the tomatoes has evaporated. Next, add the spices and mix well. When the masala has reduced to a thick consistency re-add the chicken and stir. 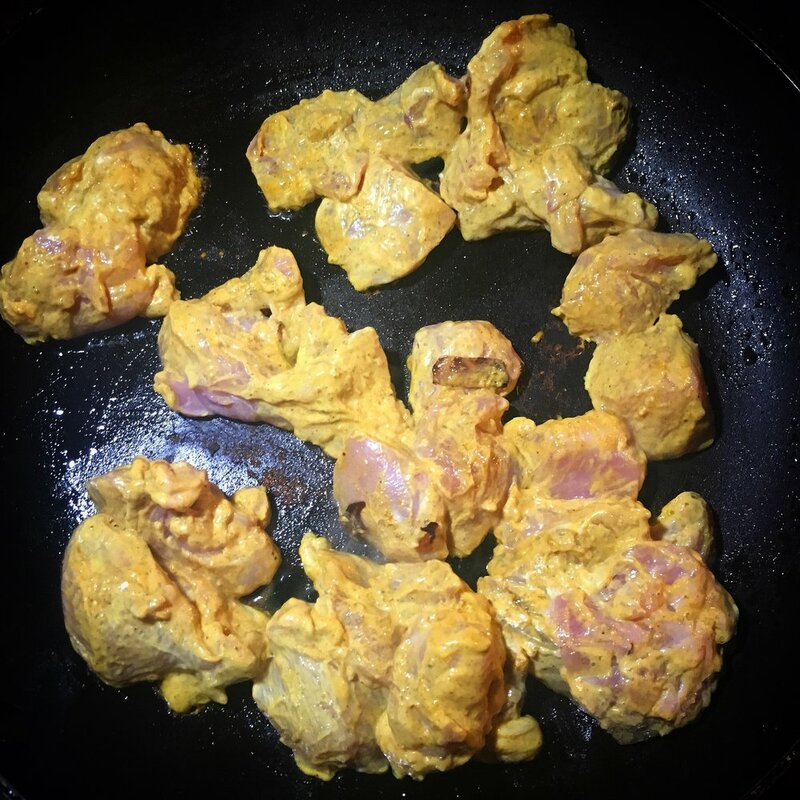 It is important to continue to cook the chicken and masala mixture for around 6-7 minutes on low heat so you are left with a dryish consistency and a sauce that thickly coats the chicken. The final and most exciting part of making a Biryani is putting it all together. The aim is to create numerous layers of rice, saffron infused milk, chicken masala, fried onions and finally fresh coriander leaves. For the saffron infused milk simply put a pinch of saffron in 100ml of milk and leave for 5 minutes. I used Uncle Bens Basmati rice pouches as I find them convenient and you are also 100% guaranteed to get perfect results. The packet says to cook for two minutes but I halved this time as the dish will be placed in the oven for a further 30 minutes. Before placing in the oven melt 15g of butter and spoon around the edges of the dish to prevent the rice from stick to the side. Biryani is often served with a raita which works excellently but my preference is to serve it on its own as you get a better appreciation of the full range of flavours.